I can actually pinpoint the moment that first piqued my interest in Japan. I remember my dad went on a business trip to Tokyo when I was a tiny kid and brought me back all kinds of cool toys and knickknacks when he came home, all of which amazed me. I still have a little handpainted kokeshi doll he got me, who's almost as old as I am. After that I progressed through the Candy Candy cartoons (a soapy, super girly anime TV show -- this might've just been a phenomenon in Japan and Spain, I have no idea whether it caught on anywhere else, but I don't think it aired in the States); Empire of the Sun, which features little Christian Bale in what I think was his first movie role; tough history lessons about Hiroshima and Nagasaki; Ran; Ghost in the Shell; the Miyazaki universe; Haruki Murakami; etc. etc. This overly dramatic intro is just to say that when I found out there was a subscription box for Japanese snacks, I probably squealed and then immediately signed up. And here it is. 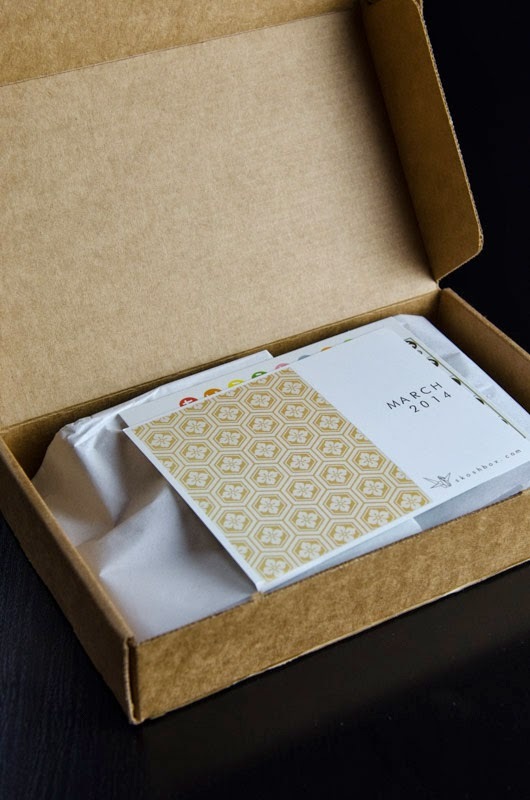 Meet the March edition of Skoshbox. 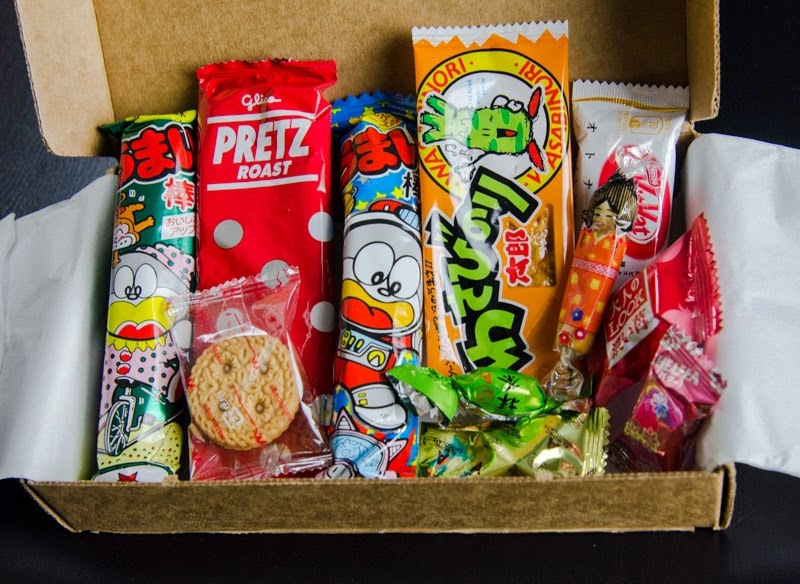 For $12 a month, Skoshbox will mail you a package filled with handpicked snacks sourced from Japan and shipped out of Hawaii. Every now and then, they'll release a limited-edition Premium box you can purchase separately from your regular subscription (the last two were rolled out for Christmas and then Valentine's Day). And that's it. No other subscription plans, options, filler. 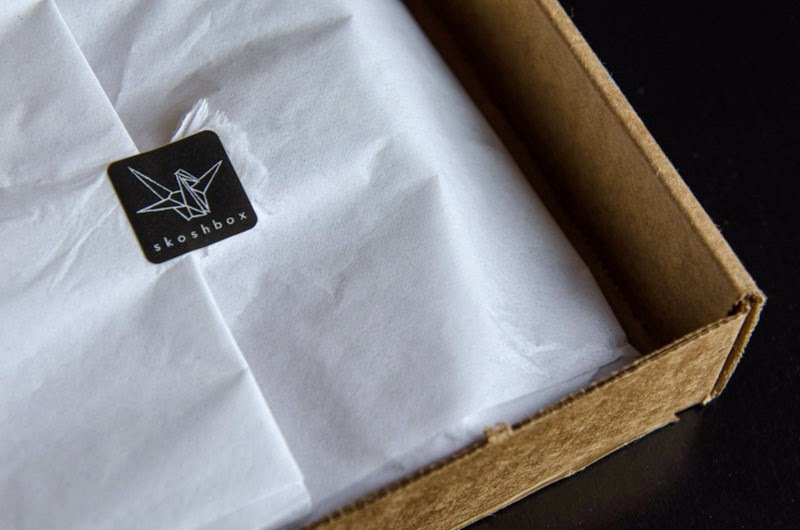 The Skoshbox crew keeps it simple and surprising, in the spirit of the best sub boxes. Overeager unboxing job --> torn tissue paper. Oops. 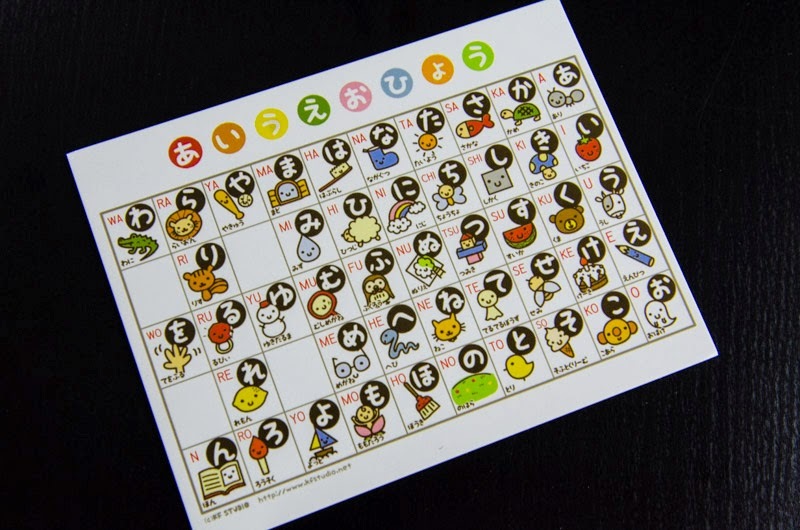 The cutest hiragana chart possibly ever, with which you can practice writing and sounding out Japanese characters. 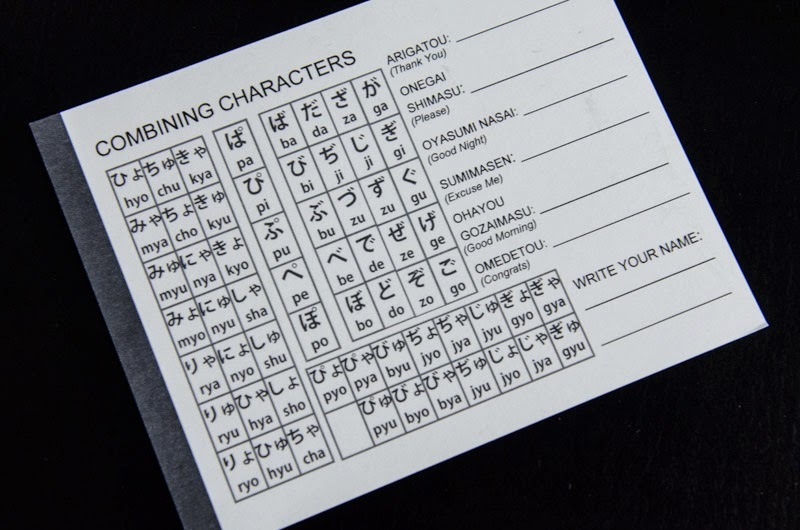 The back of the card is a mini-workbook! But you're really here for the snacks, right? Let's get to it. Too much cute. Maximum kawaii. See what I mean about needing the info card though? Love the info card. 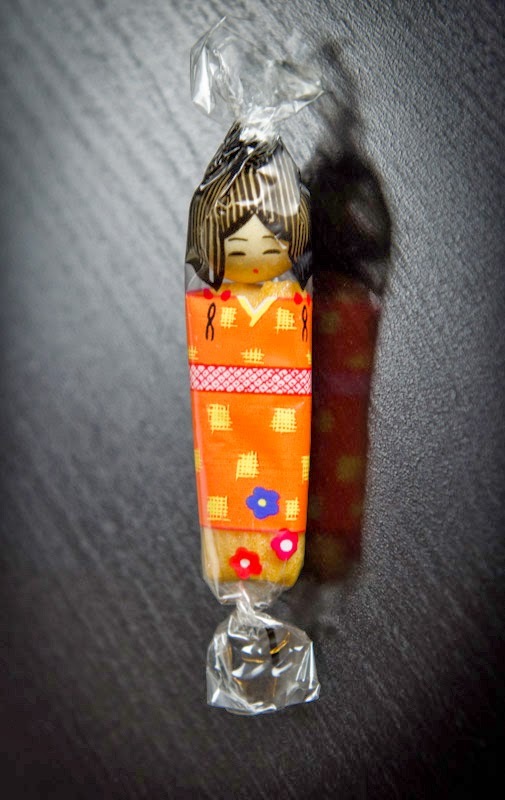 This adorable little lady is actually Kokeshi Arare, or baked rice crackers in Girls' Day wrapping. Girls' Day, also called Doll's Day or Hinamatsuri, is celebrated on March 3rd. Check out the ancient origins of the Hinamatsuri tradition here (thank the Universe for Wikipedia). I haven't actually tried this yet, because it's too cute to eat. But I'm sure I'll break down eventually. Dried fish jerky strip in spicy wasabi (orange wrapper). Kit Kat White, which is supposed to taste like Oreo ice cream. 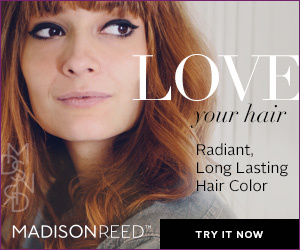 Or, in other words, heaven. Strawberry Look Chocolate, a chocolate square with a tart strawberry center. Pretz Roast, or buttery biscuit sticks. 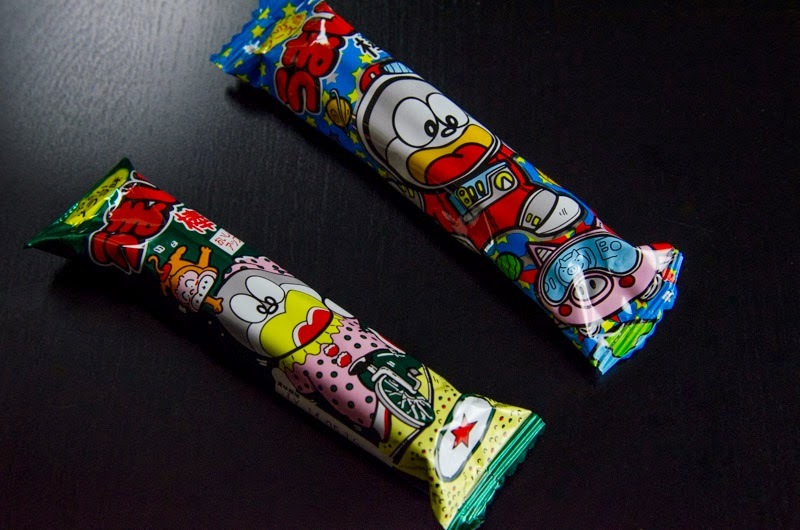 Umaibo sticks in salad flavor (green, left) and tonkatsu sauce (blue, right). These! These are revelation on a stick! 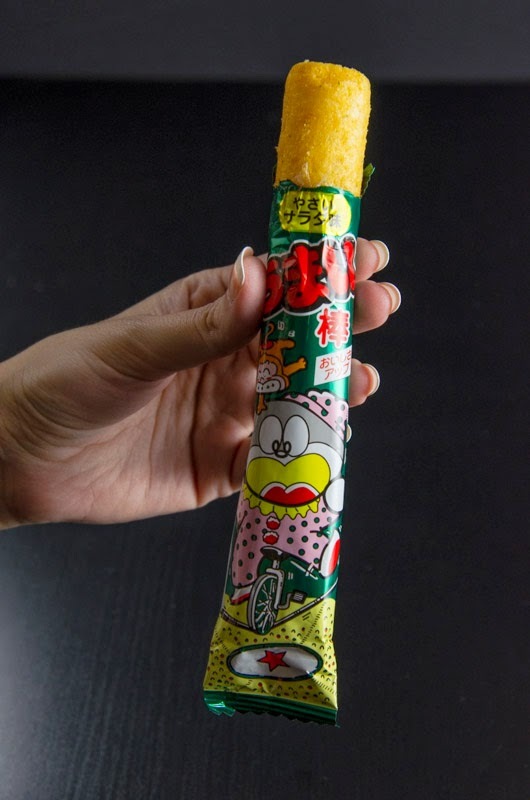 Think of a super light, airy, giant cheese puff, and that'll give you an idea of the texture and consistency of these umaibo sticks. But that flavor! The flavor is like nothing I've tasted before. I tried the salad flavor having no idea what I was getting myself into, and it was amazing: by turns sweet and salty and savory, with that indescribable deep umami undertone (MSG, I <3 U). The boxfullove seal of approval. You'd better believe I was combing ebay for more of this crackly goodness as soon as it was gone. 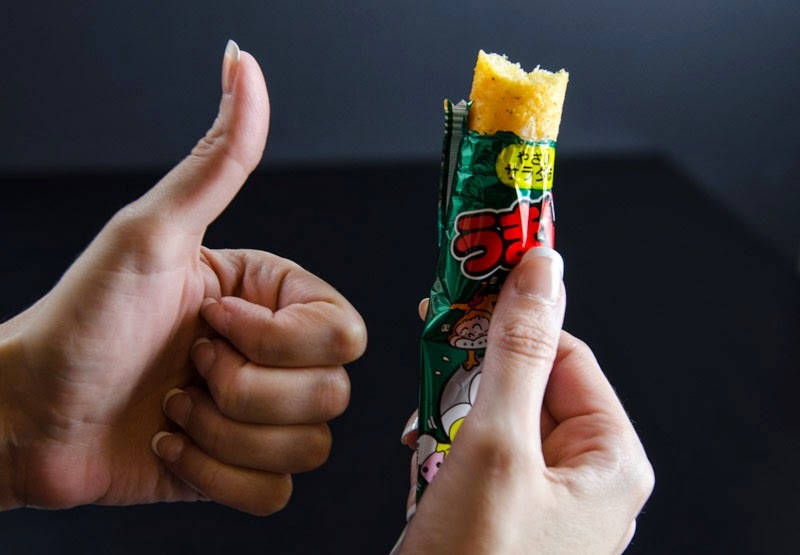 Speaking of buying stuff, you'll notice I'm not listing prices for the individual snacks in this review. That's for a few practical reasons: most of these products are probably bought in bulk in unguessable (at least for me) quantities and divided up among multiple boxes, and most are also probably only available in Japan, so all the converting from yen to dollars and guesstimating bulk amounts and pro rating to get a tiny unit price is just way too involved for this type of review. Plus, rather than a bang-for-buck sub service, Skoshbox is all about the experience. You're paying for a curated product that's a) unavailable outside the United States and b) delightful, so counting pennies is really besides the point. Green tea chocolate with almond (green twisty wrapper). Chelsea scotch candy in butterscotch (pink wrapper). Apple pie cream sandwich (round cookie). Creamy chocolate with almond center (gold wrapper). Bottom line(s)? If you're trying to eat healthy, avoid sweets, avoid artificial ingredients, and/or are sensitive to MSG, you'll want to steer clear of this subscription. But if, like me, you're more of the Anthony Bourdain school of thought (i.e. "your body is not a temple, it's an amusement park"), then this is the sub box for you. It's fun, it's an adventure, it's a sensory experience, it's just generally really cool. So what did you guys think about Skoshbox? 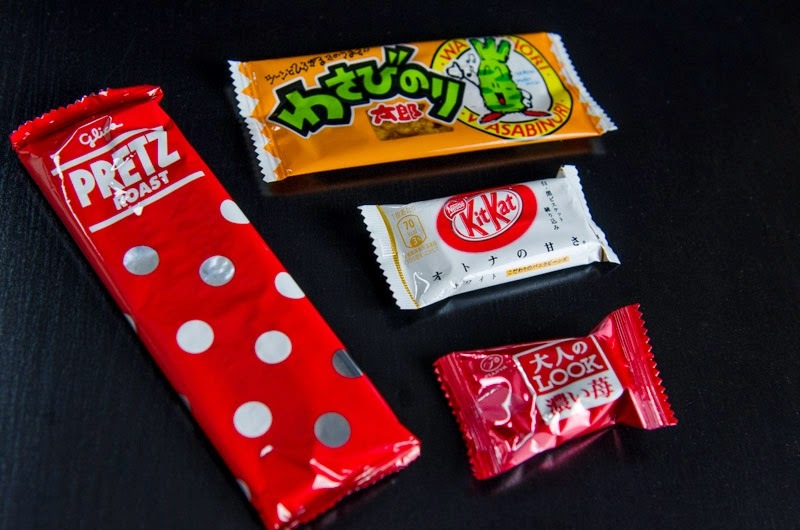 Which of these candies or snacks would you want to try? 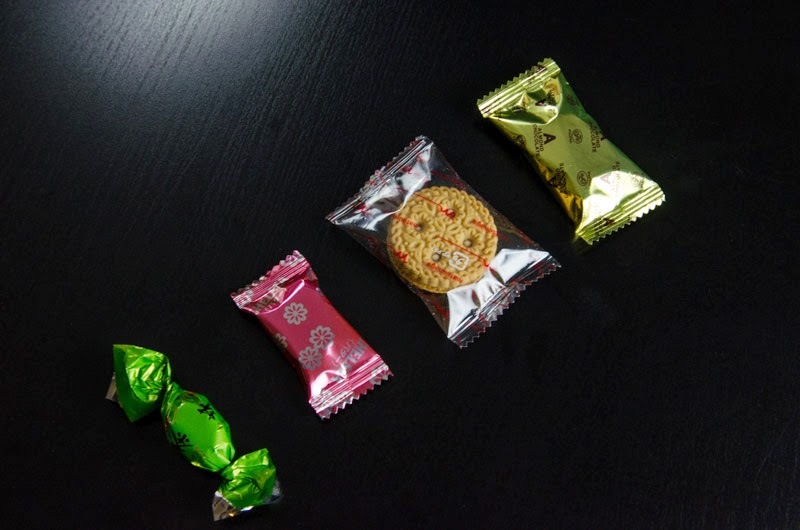 If you want to learn more or are sold and ready to sign up for a monthly delivery of Japanese snacks, go check out the Skoshbox website. Love the idea of this sub! And yes, I <3 MSG too, haha!